This survey came up in my Facebook feed. Now if you’ve followed this blog for some time you probably know my politics. I’m ultra-left liberal. I feel discrimination of any form when it comes to race is wrong, and that government should never allow the people to pass laws to restrict rights. This particular survey is about crime and punishment. I think our current system is seriously broken and that the punitive aspects should be reduced while the rehabilitation aspects enhanced. 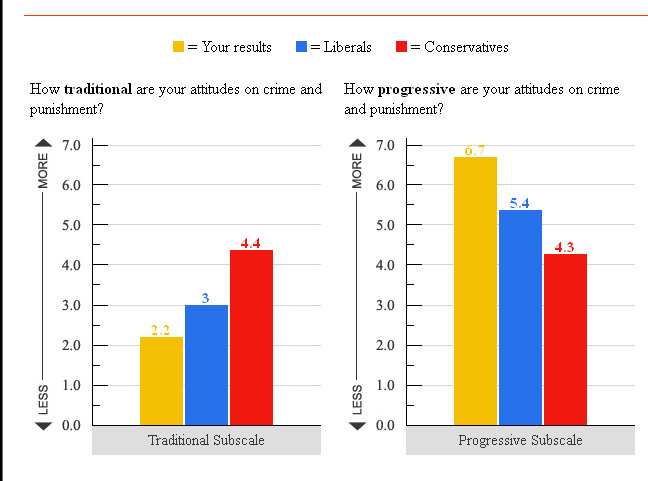 I’m one standard deviation lower than liberals when it comes to traditional values on crime and personal responsibility. And about the same on the Progressive scale too. When it comes to conservatives I’m two standard deviations away. Not a surprise there. But I do think we need to move liberals more to where I am on the scales.